Cloud Thinking | How might we collaborate to (re)design? How might we collaborate to (re)design? I have never thought of myself as a designer even though as an educator I design learning experiences every day. Things like learning for adolescent students; which is pretty tough stuff. I prototype my ideas everyday, redesign and on the odd occasion I get it right. In fact teachers will talk of lesson design. Pedagogy is at a meta-level all about design. But to take ownership of the label ‘designer’ seems strange even though in the tertiary sector educators are employed as ‘learning designers’. Go figure. In my last place of employment, I was involved in pedagogical and strategic discussions that led to the redesign of a major learning space that previously had been used as an auditorium space. I was able to speak into this space of museum education and help drive just a little bit the redesign process; although not as significantly as I would have liked – that’s a whole other blog post. Anyhow, this auditorium space was reconfigured to allow student centred workshops to take place, rather than large group presentations. In effect this was a simple experiment in learning space design – reshaping a space to impact on student learning. The space did not quite work out how I, as an educator, had envisaged but still it allowed us to house new approaches to teaching and learning. 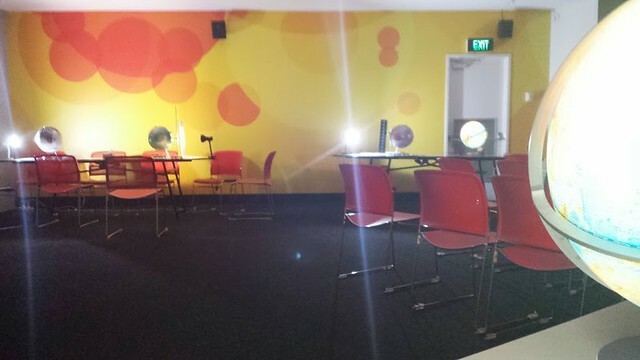 In response to this redesigned space I was called upon to work collaboratively with other museum educators and a P12 school to redesign the learning that took place in this space. The story of how we went about this is detailed in the following document “Reasons For The Seasons Learning Story”. This project hints at the power of collaboration and how stakeholders from different sectors can work together to improve student learning. This is just a small way in which student learning has been improved by a design approach, in this case an intentional attempt to bring hands on learning to the museum sector. Please gift me with your feedback. This entry was posted in Learning Spaces. Bookmark the permalink.